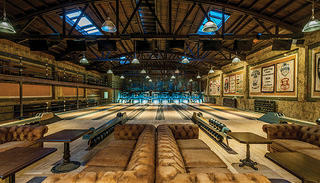 Prohibition was well under way when Highland Park Bowl opened in Los Angeles’ Highland Park neighborhood in 1927. But a prescription for medicinal whiskey could be obtained from the doctor upstairs and conveniently filled at the bowling alley’s “pharmacy.” The eight-lane bowling alley and bar thrived long after Prohibition’s repeal in 1933. Renamed Mr. T’s Bowl in 1966 for new owner Joseph “Mr. T” Theresa, it later became a well-known punk music venue before closing in 2014. That year, local bar proprietors 1933 Group acquired the space and soon began rehabilitating its Spanish Revival facade, bowling lanes, and ball-return machinery. They restored a 1930s mural and uncovered a bow-truss ceiling and skylights. The space reopened under its original name in April as a bowling alley with a dining area, a space for live music named for Mr. T, and multiple bars—no prescription required.